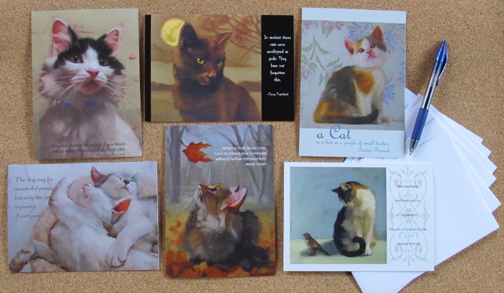 A special collection of greeting cards featuring paintings and favorite quotes...best shared with the cat person in your life. Free shipping to the USA, if you are outside the USA, I will bill you for shipping after purchase. 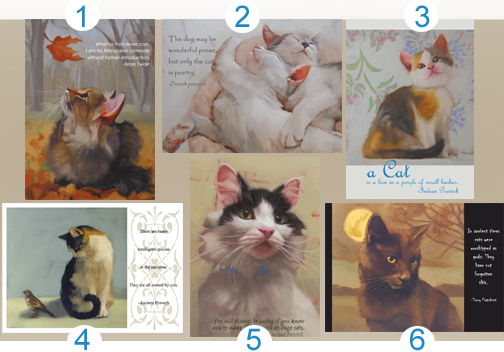 1 Cover: When a man loves cats, I am his friend and comrade without further introduction.-Mark Twain Inside Message: Wishing you a puuuuuurr-fect birthday! 2 Cover: The dog may be wonderful prose, but only the cat is poetry.-French Proverb Inside Message: Your kindness is poetic. Thank you! 3 Cover: A cat is a lion in a jungle of small bushes.-Indian Proverb Inside Message: Wishing you a roaring recover. Get Well Soon! 4 Cover: There are many intelligent species in the universe. They are all owned by cats.-Ancient Proverb Inside Message: May your resident feline allow you cake on your special day. Happy Birthday! 5 Cover: You will always be lucky if you know how to make friends with strange cats.-Ancient Proverb Inside Message: You are the cat's meow! Happy Birthday!